Sate Madura is typical sate Madura. Sate Madura usually made from chicken. Known as the island of Madura, in addition to salt, is also popular with satenya. Sate madurese already famous all over the archipelago, Sate Madura can be found in almost all regions, especially in big cities such as Medan, Jakarta, Bandung, and Surabaya. It is said that the scarcely sate Madura own. But in addition to chicken satay as well as the main ingredients there that use goat which is marked by hanging the goat's hind legs in rombong the satay seller. Marinade is a mixture of finely ground nuts and a little onion paste. Roast it with fire of coconut shells that are burned first, called coconut shell charcoal. It was tasty but dipantangkan to those people with high cholesterol and acute gout. 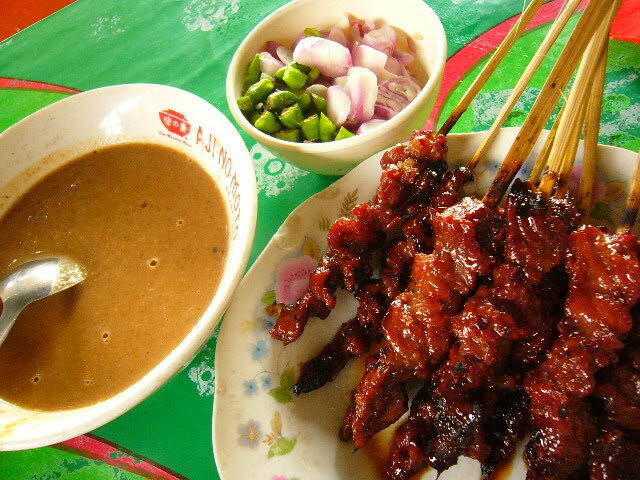 Sate Madura are generally fed chicken satay peanut sauce sambal form. But in Madura itself is sometimes used but not peanut sauce or chili sauce hazelnut. Also often skewers of charcoal burning is often sprinkled with lemon juice. To reap more profits, traders often satay seasoning mix with rice, dry beans have been mashed. This dry rice, in the language of Bali called senggauk, leftover rice which is dried in the hot sun. In some areas of Java, such as the north coast, along the coast (north coast) covering the area of Indramayu, Bradford, that kind of rice called parched rice. Commonly eaten by poor people who can not afford to buy even the cheapest rice.